Too corny? I think so, but we’ll give it a shot. For some reason I really like alliterations. I thought having a purpose to my posts might help me stick with it, even when things get crazy. Mommy Monday posts will be random thoughts and experiences while being a mom. I’ve got a whopping 8 months in so I’m an expert, right? Yeah, well, no, but I’m learning as I go and you can all join me in the process. So, without further ado, today marks the first “Mommy Monday” post. With my background in dietetics, I knew that breast milk was the best thing for Eli and I planned to breast feed exclusively for the first 6 months and continue for at least a year (if my supply allowed – which is absolutely does – more on that some other time). Being super type-A, I started to read about introducing solids around 3 months so I’d be prepared. 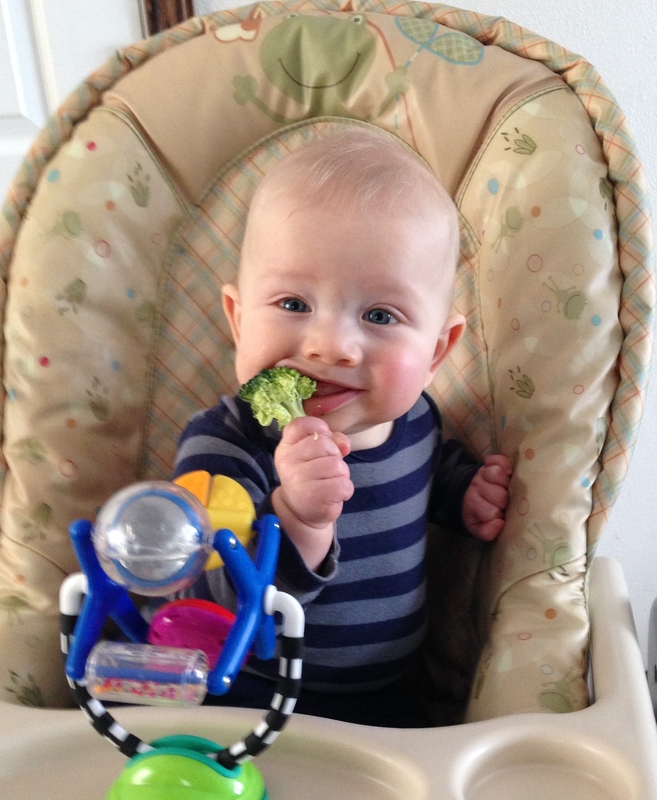 I was very interested in baby-led weaning (BLW) and decided that would be the route we would generally go. I didn’t want to waste money on baby food and who has time to puree everything? 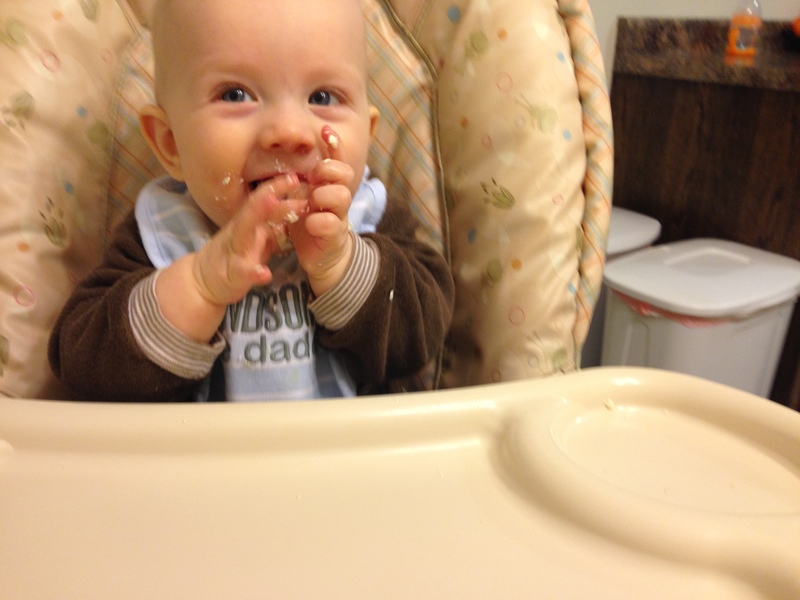 My skeptics talked about how Eli would choke on solids. So, I did a pubmed search to see if any studies were out there on BLW. Sure enough, a handful of studies exist. What is the consensus? Well, babies who followed BLW were no more likely to having choking or gagging episodes during the entire weaning process than those who were weaned using stages of solids. Yes, they tended to gag more than their age-matched peers (i.e. BLW kid getting chicken while the traditional kid got rice cereal – of course there is more gagging with chicken), BUT when the traditional kids finally got to solids, they gagged just as much as the BLW kids did previously. So the difference is just when the gagging happened (6 months vs 12 months old). Again, there was no difference in choking episodes, so BLW kids gagging earlier didn’t mean they choked more. They just learned how to handle solids sooner. What else did the studies find? Well, kids who did BLW were leaning, more in-tune with their hunger/satiety cues, and had a broader palate for food. Yes, yes, and yes! All things I hope for Eli. After all of this, I had no doubt that BLW would be the way to go for us. 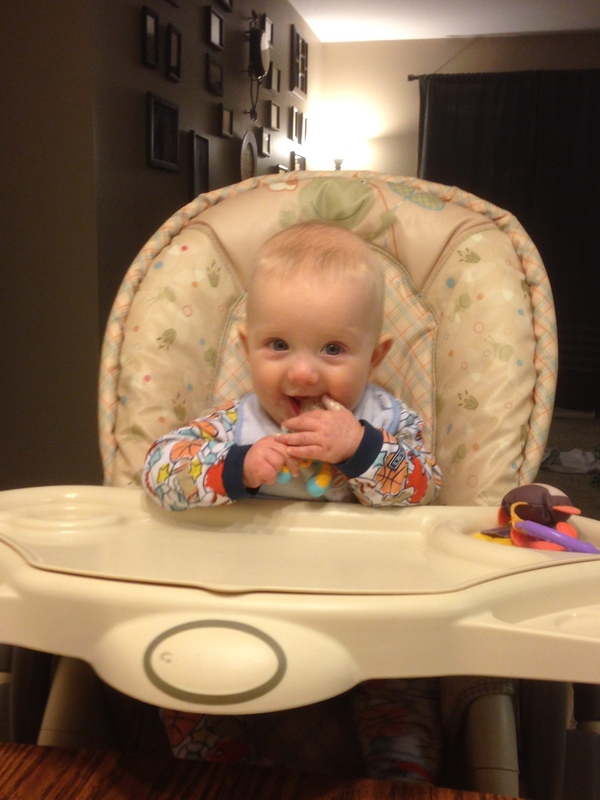 Around 4 months, Eli was sitting up unassisted in his bumbo and started to take a lot of interest in what we were eating. He would grab at everything and bring it to his mouth. It was obvious that he wanted to join in. So I realized that waiting to 6 months wasn’t appropriate – he was ready for solids at 4 months, regardless of what some book says. All kids are different and the key is to use the guidelines as guidelines and modify them as needed for the individual child. 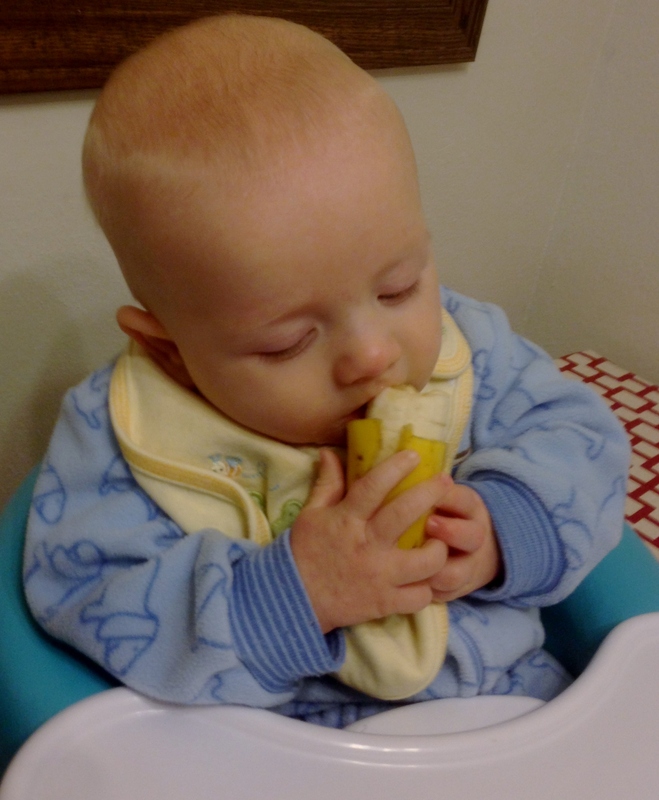 So Eli’s first food – a banana! He handled it so well. Take a look here. We offered him foods here and there, but nothing rigid. We decided it was more about him learning about new foods than getting his nutrition from them (he was still eating breast milk the rest of the time and growing well). There were some foods that scared me a bit and I decided it was best to do a modified version of BLW. He got some textured purees, like applesauce, and some solids. Sometimes we fed him, sometimes he used his food feeder, and other times he just used his 2 hands. 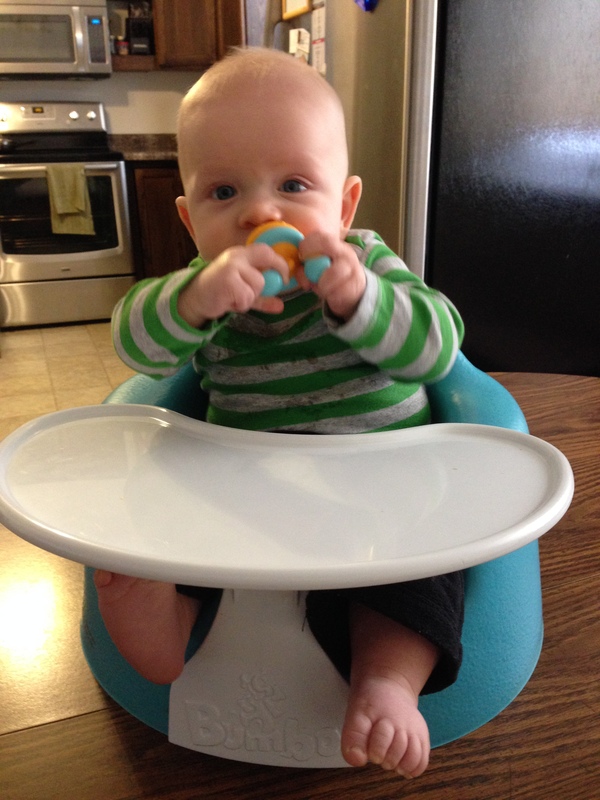 Around 6 months we decided to be more regular with his solids. We began offering him 3 meals a day and were trying a variety of foods. We offered mixed foods and didn’t follow the traditional “1 food for 3- 5 days” method. Yes, there was a chance he wouldn’t tolerate a food and we wouldn’t know what the cause was, but I was willing to take the risk. He was developing a very broad palate and absolutely loved food. Around 7 months he had the chewing (or gumming since he doesn’t have teeth) motion down. I was amazed watching him – how did he figure that out?!? I could give him a strip of toast or chicken and he could gum the whole thing down without gagging once. Amazing. I’ve taken pictures of Eli trying new foods over the past few months and plan to put page together with all of these. In the meantime, here are a few to enjoy!